Faust goes on to describe two other contemporary intellectuals who are also lifting up the importance of reexamining the history of slavery and the way that is still powerfully affecting the present moment. Both were influenced by Franklin’s work. 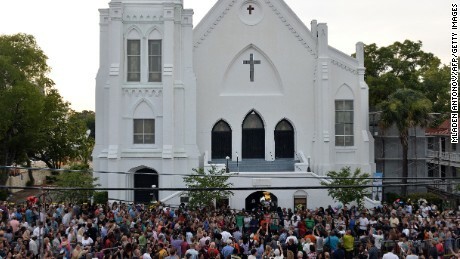 The shock of the wanton and racist violence in Charleston, SC, where nine African-American church people were murdered, must be fully registered in us, even as it causes pain and confusion. For a moment, and then many moments to follow we must let ourselves feel the outrage and disbelief that this tragedy engenders. We mourn the loss of these nine souls: Cynthia Marie Graham Hurd, Susie Jackson, Ethel Lee Lance, Depayne Middleton-Doctor, Clementa C. Pinckney, Tywanza Sanders, Daniel Simmons, Sharonda Coleman-Singleton and Myra Thompson. We stand in solidarity and grief with their families. As we feel the pain in our own hearts we join our voices in the lamentations of our brothers and sisters who are hit hardest by this. As progressive Christians we know that this attack was not just an isolated incident, but part of a much larger picture, one that reaches back in history. We must acknowledge the ways that hate and discrimination are woven into the fabric of our culture. A white man killing African-Americans—this is not a new story. It has happened over and over and continues to happen. Enough! It must stop. The insidious power of terrorism—targeted violence intended to do both direct and indirect harm—is that at a fundamental level, at the level of basic physicality—we experience what happens to others as if it is happening to us. And if an act of violence is perpetrated on a specific group, all members of that group will feel the reverberations of the act in a frighteningly personal way. This physical reality, however, is also a blessing. This deep sense of identification is also the root of compassion—“feeling with.” It is what makes it possible for us to experience the powerful ways that all of us are connected across lines of race, class, gender, religion, sexual orientation, gender expression and ability. The people who were killed in South Carolina are our people. And so, we let our tears flow and then we stand up and act. We give voice to our care and concern and we speak up against the patterns of violence. We hold our brothers and sisters in our hearts and we join hands to march together for justice. Let us lift up the fundamental value of each and every life—God’s presence in all of us. Let us recognize that we are one body and when one suffers we all suffer. Let us break the patterns of silence and passivity and take each small opportunity available to us to change the way things are into the way they can be. Let us shape our politics and policies accordingly. The recent events in Baltimore surrounding the death of Mr. Freddie Gray while in police custody are full of pain, power and possibility. While significant in and of themselves, they also connect with other similar events that have taken place in relatively recent times and also with a long and painful history of unjust treatment of people of color in the United States. Because of both the particularity of these events and their connection to a bigger picture, it is important to keep sight of the range of need and possibility. 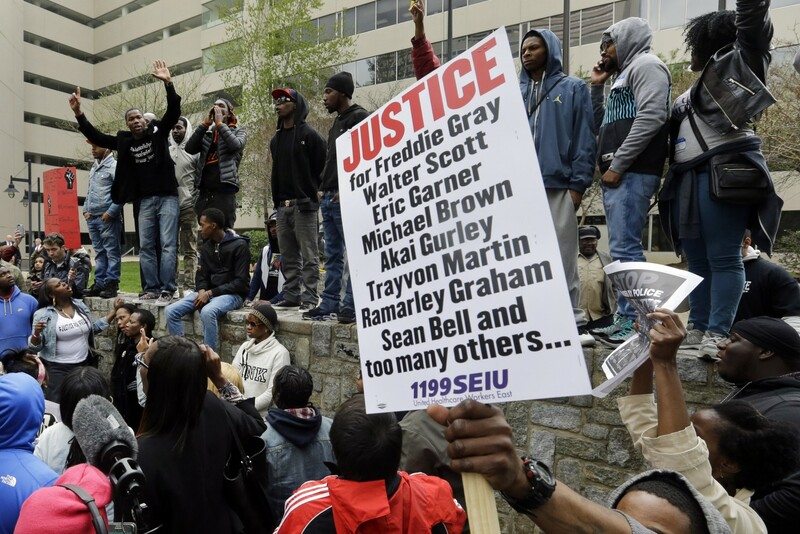 Justice is sought, not just for Mr. Gray, but for the many who are wronged through the criminal justice system. Racism underlies much of the inequality in our systems and we have an opportunity to address larger issues at this time. The convergence of galvanizing events, public attention and a vision of how things might change doesn’t happen very often. One can work year after year on an issue and not be able to get much traction, then a series of events (it usually isn’t just one) propel it to a new level of energy, intention and action. It will be unfortunate if the story of Baltimore is only about buildings on fire, police in military gear and brick-throwing. Although this seems to be the primary or only attention mainstream media can pay, other stories of non-violent protest, community organization, interracial cooperation, and deep soul-searching are also there to be told. And it will also be unfortunate if we miss the opportunity to hear and to speak the ideas for change that are rising up. We can help propel the ones that are promising and powerful and seem to be catching the attention of the broader community. As people of faith, we have opportunity to both deeply witness the pain and struggle in these events as well as lifting up systemic shortcomings that can be addressed. We can do this both as individuals and as communities. The more any particular idea or possibility becomes part of the awareness of the “bigger body” the more likely they are to create real change. We must lift up the value of every single life and give special attention to support for people of color. This is also a time and opportunity to address the particular needs of young men of color. This doesn’t preclude lifting up those of other ages or gender, but this is a particular moment that we mustn’t miss to allow our attention to focus. The common experience of many people of color of being mistreated or disrespected in large and small ways by the police needs to be heard and acknowledged, especially by white people. The Maryland Law Enforcement Officers’ Bill of Rights says that when an officer is under investigation in a matter that could lead to disciplinary action, supervisors are prohibited from interviewing the accused officer for 10 days. This law delays justice and interferes with the swift search for the truth. In many cities, the review of incidents involving death or injury of suspects at the hands of the police are left to police departments who may maintain strict control over the information that is being gathered. This leads to a lack of transparency and a sense of suspicion that the full truth will not be available to the victims and their families. The general public needs to be able to trust in these processes in order for the criminal justice system to be seen as legitimate. The militarization of the police can be challenged and the concept of community policing can be promoted. The use of body cameras by police and the protection of those who might videotape an incident can be promoted. The broad issue of mass incarceration, especially of young men of color, can be addressed in a variety of ways, including shifting many laws currently classified as felonies to misdemeanors, challenging the policies of the “drug war”, changing mandatory sentencing guidelines and eliminating the ways that those convicted of felonies are further punished or disadvantaged after they have paid their debt to society. A national conversation is taking place right now about racism and injustice. May we be an active part in that process and take the opportunities we see to propel the conversation. First Church’s Senior Minister, Patricia de Jong, has announced her intention to resign in May of 2015. The church has begun the process of seeking her replacement. The Diversity Team sent this letter to the Committee of Involvement at First Church Berkeley, the group that was responsible for recommending a slate of candidates for the Senior Minister Search Committee. As you may be aware, First Church’s Diversity Ministry Team gathers monthly and has sponsored several events, workshops, and learning hours over the last several years. Our team seeks to discern how to respond to the pronouncement calling the UCC to become “multicultural and multiracial”. Offering speakers, resources, and space for open conversation, it seeks to promote congregational awareness that, progress notwithstanding, prejudice and discrimination remain acknowledged realities in the church and the wider world. up the importance of race in particular, and suggest that the committee strive for a search committee that has multiple people of color as members. We further recommend that the search committee and the congregation as a whole actively seek out and encourage candidates for the senior minister position who are people of color. and people of color are not fully represented among leadership roles in society. During the Identity Study Team and Human Capital Campaign processes in 2008-09, diversity emerged as one of the areas important to church members—both honoring the existing diversity in our congregation and becoming more diverse, multicultural, and intercultural, in part by reaching out to the communities around us. sometimes not sufficient, to becoming a diverse, multicultural congregation. While we have some members who are people of color, as a whole First Church, like most UCC and other mainline Protestant churches, has a large majority of our members who are white. Despite our best intentions, some people of color may feel uncomfortable visibly “standing out” in such a community, and hesitant to participate in committees or other small subset of the community where they may be the only person of color in the room. Recruiting people of color for the search committee and as candidates for the senior minister position must go beyond simply being open to people of all races who apply or are nominated and include active recruitment and encouragement including outreach specifically designed to increase the pool of qualified and willing candidates who are people of color. It is also important for everyone involved to be mindful of how race may influence consideration of nominees/candidates. We as the Diversity Ministry Team pledge to support the Committee of Involvement and the search committee in this process, particularly in recruiting people of color as nominees/candidates. We would welcome further dialogue with you or others involved with this process. The Diversity Ministry Team at First Church Berkeley is exploring issues of the disproportionate incarceration of people of color, especially African-American men. This series of ten articles, published on OaklandLocal.com, looks at these issues in Oakland and beyond, providing stories, analysis, new ideas and political context. One of the writers in this series, Barbara Grady-Ayer, is a member of First Church. The annual cost of incarcerating an inmate in 2010-11 was $48,895 and in 2012, it is estimated to rise to $55,527. The Department of Finance estimates that the average cost of parole supervision for 2011-12 was $7,616. But that is just the tip-of-the-iceberg in terms of the costs to entire communities in Oakland. Realignment is the biggest shift in the criminal justice system in the past 25 years and criminal justice advocates around the country are watching to see how it plays out. The California Department of Corrections and Rehabilitation reports that 67 percent of California state parolees return to prison within the first year after release. Within the first three years after release, it goes up to 76 percent. Alameda County has put together a comprehensive re-entry program to help ex-offenders surmount common hurdles. Some barriers to reentry for ex-offenders are obvious: housing is costly, employment hard to find. There are others. Prison and street life create anti-social behaviors that make it very difficult to re-integrate. You can have all the job skills, all the addiction treatment, but if you don’t get to the underlying core issues that drive this behavior, it won’t work. Offenders behave like criminals because they think like criminals; changing thinking is the first step towards changing behavior. Keeping Families Together: What’s it Like for the Kids When Mom or Dad Are in Jail or Prison? The trauma of parental incarceration often causes anxiety, guilt, shame and fear in addition to low self-esteem, withdrawal, decline in school performance and/or the use of drugs or alcohol. Two out of three kids who drop out of Oakland public schools come into contact with the criminal justice system. In some of Oakland’s poorest neighborhoods, more than half of high school students do not graduate. Thousands of Oakland’s youth have been affected by having parents in prison or jails. Teens have an increased risk of delinquent behavior and an increased likelihood of school failure along with a sense of stigma and shame that impacts on their sense of who they are in the world. Nick Smith was shuttled from high school to high school in recent years, whenever a relative died or was shot. By the time he got to Oakland Technical High School his senior year, he discovered he hadn’t taken enough core academic courses to graduate. Nobody had counseled him to take the right classes. The best way to reduce crime is to give families and communities what they need to become strong, productive and viable member of their communities. First Church spent three Sundays in July studying The Cross and the Lynching Tree by James Cone. As a result of that study a group of about a dozen folks met to discuss next steps. Below is the list of possibilities that were named. The group will continue to move toward focusing on certain actions as a group. In the meantime, several people volunteered to take some individual initiative in relation to these topics. Do you have thoughts about other possible responses? Feel free to add them in the comment section. Respond to President Obama’s call for ministers/clergy to respond to recent incidents of violence (such as at the Sikh temple) by making sure there is a UCC presence in the conversation. Seminary Intern Andrew Greenhaw reflects on justice and injustice, following a weekend celebrating Dr. Martin Luther King, Jr. This post originally appeared on the Wisdom from First Church blog. Having the opportunity to preach this last Sunday as our community celebrated the life and ministry of the Rev. Dr. Martin Luther King Jr. was a privilege. 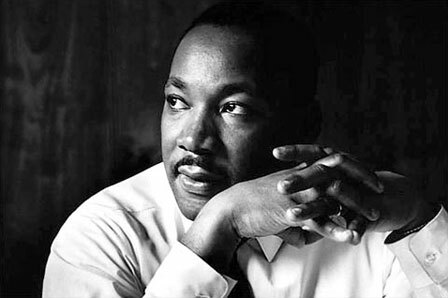 As I worked to prepare the sermon, I read and reflected on King’s incredible response to God’s call to justice. King had a gift for hearing God’s word for our society and had the courage to respond to that word. During my time here at First Church, I have noticed time and again this congregation’s concern for justice, whether it be the Occupy movement, the UCC’s Mission 1 Food Justice Campaign or the unlawful imprisonment of detainees at Guantanamo Bay. Last week as I was reading and reflecting on King’s life in preparation for my sermon, I heard another call to justice. On the local news was a story about a man named Marcel Johnson who had been arrested at the Occupy Oakland camp. After being taken to jail, Johnson, who also goes by Khali, did not receive his psychiatric medication and had an altercation with a corrections officer. Because of Khali’s prior arrests, under California’s three strike law he may now face life in prison on charges stemming from the altercation. I do not know Marcel Johnson, but I know that this is injustice. We live in a country that locks more people in prison than any other. And it is widely known that a horrendously disproportionate number of those locked away are, like Marcel Johnson, African American. It may not be as widely known, but is no less true, that a shocking number of those imprisoned for life under California’s three strikes law are black men convicted of non-violent crimes. This is not justice. This cannot stand. If we are concerned for victims of torture, if we are concerned for prisoners at Guantanamo, let us also be concerned for Marcel Johnson and prisoners here in California. If we want to honor the work of Martin Luther King Jr., let us speak out against the mass imprisonment of black persons in this country. I know how much this congregation cares about justice and how much it does to bring about justice. So when I heard the call to justice in Marcel’s story, I felt I needed to share it with you. More about First Church Berkeley.